Accuracy: I have done no preliminary shooting with the Grach NBB BB pistol so other than how the trigger feels I cannot comment too much on the performance. I would expect to get pretty close to the factory claimed fps based on my other testings with Gletcher products. With its single action trigger and white dot sights I am hoping for a fairly tight grouping when I perform my accuracy test later on. Realism: The Gletcher Grach is a 1 to 1 replica of the Russian Yarygin (MP-443 Grach), all the mechanical parts function just like you would find on the real steel version. The only indicators that it is not a real Yarygin would be the smaller barrel opening since the 4.5mm BB barrel is not recessed at all. Even the weight is near identical to the original MP-443 Grach coming in only 10 grams heavier. Comments: Without shooting this gun so far all I can comment on is how nice it looks and feels, the Gletcher Grach NBB really is a well-made and detailed CO2 air pistol mirroring the original real steel Yarygin (MP-443 Grach) almost exactly. Pretty much everything is metal on this pistol helping it come in only 10 grams off again of the original. I like the single and double action trigger / hammer and the working slide and slide catch release that locks back when the BB magazine is empty. I am really looking forward to giving this gun its field test shooting review! -20 Round full size drop out magazine. 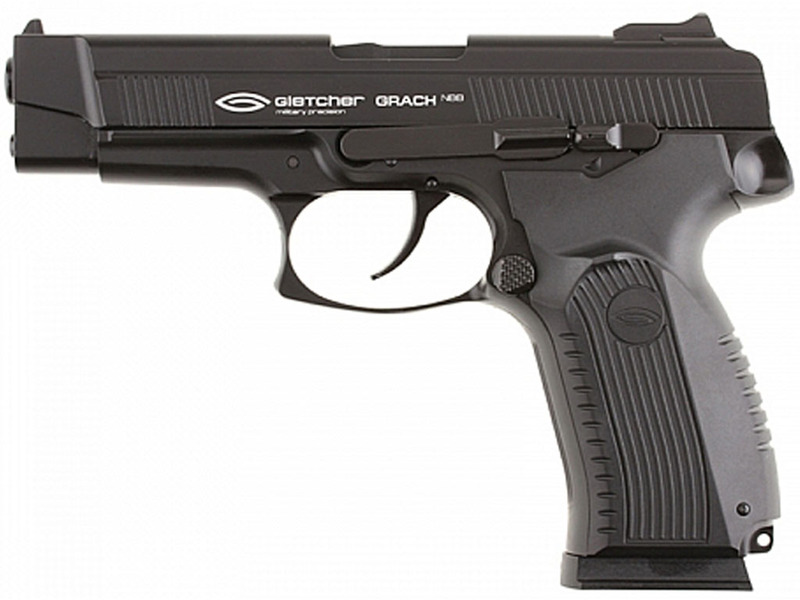 This video is a walk through review of the Gletcher Grach NBB CO2 Non-blowback BB Pistol. I show off this BB Replica close up from all angles and point out the mostly metal construction and go through the features and benefits of this very unique Russian replica BB pistol. I also Field Strip the Grach in this video for you. 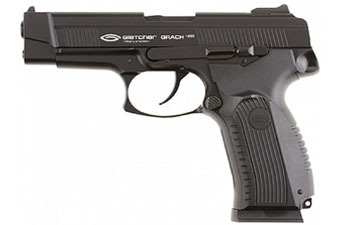 This is my Official Field Test Shooting Review video for the Gletcher Grach NBB CO2 BB Pistol. You can also checkout my Table Top Review of the Gletcher Grach NBB where I show you around this Russian Replica BB Pistol and talk about eh specifications and features. I even do a field strip for the Gletcher Grach. In this Field Test Shooting video I test out the performance of the Gletcher Grach NBB using my Chronograph to get a real world Feet Per Second rating, I also take aim 30 feet back and shoot 10 rounds at a paper target using a semi-rested position (Sand bag up front and standing in the back). In terms of velocity the Gletcher Grach NBB CO2 BB Pistol performed a little lower fps then I expected shooting just under 350 fps. It was about 15 degrees celsius on this day but I also kept the pistol indoors where it was nice and warm right up till shooting time. I used a brand new CO2 and my ammo of choice was RWS 5.1 grain zinc coated BB's. Stepping back 30 feet and shooting at a paper target, the Gletcher Grach NBB CO2 BB Pistol produced a very tight 10 shot 1 inch grouping, not many BB's pistols have been able to get in that 1 inch grouping at least for me! The Gletcher Grach did shoot a little to the left and a bit low but not far off the bullseye. The sights are not adjustable so you will have to slightly adjust your aim point if you find yourself not exactly dead center. I found the Gletcher Grach NBB to be extremely quite so if you are looking for a discrete backyard shooter then the Grach would be a good choice. I also found the trigger to be very good in both single and double action but when the BB mag is loaded to the max, the trigger first stage will be very heavy since the follower spring is holding the BB's in place and creating friction while a BB is loaded into the chamber. To fix this problems simple don;t load as many BB's in the magazine. I really like the Gletcher Grach Non-blowback CO2 BB Pistol and hope to get my hands on the Blowback version at some point to see if it performs as good.